UNIVERSITY PARK – Aside from Matt McGloin, no Penn State player benefited more from the Bill O’Brien era than record-setting receiver Allen Robinson. And just like O’Brien, Robinson’s time at Penn State has come to an end. The receiver is foregoing his final year of eligibility to enter the NFL draft, where he is expected to be selected late in the first round or early second round. Robinson entered the 2012 season as a total unknown after catching only three passes in 2011, but he wound up breaking the school’s single-season receptions record with 77. He shattered that mark this season with 97 catches and also set a school record with 1,432 receiving yards. The 6-foot-3, 210-pound Robinson received several first-team All-America honors in 2013 and was named Big Ten Receiver of the Year each of the past two seasons. The most memorable of his many achievements came when he made a spectacular leaping catch at the 1-yard line in the closing seconds of regulation against Michigan this year. The Nittany Lions scored to tie the game, then won in four overtimes. “It was a pleasure playing with this dude, and I can’t explain how happy I am for him. Best of luck and keep climbing,” quarterback Christian Hackenberg tweeted Thursday, along with a picture of him and Robinson. Miami (Fla.) coach Al Golden is considered a strong candidate for the Penn State job, and the reporter who covers the Hurricanes for The Associated Press had some interesting tweets Thursday night. “The Al Golden Watch at Miami is very, very real,” Tim Reynolds tweeted. Bill O’Brien made some pointed comments about the so-called “Paterno people” who made things difficult at times during his tenure. His comments were made a month ago but just appeared Tuesday night on Pennlive.com. “Look, it’s a good question, but let me say this,” the athletic director said. “Our fans are passionate. Our fans believe in Penn State. And going forward, the new coach is going to understand that, that our fans are great and they’re tremendous and that they have energy, and perhaps that’s why they express themselves. It’s not uncommon for players to back a coach already on the staff when the coach leaves. Penn State’s players did that with interim coach Tom Bradley in 2011 after Joe Paterno was fired. 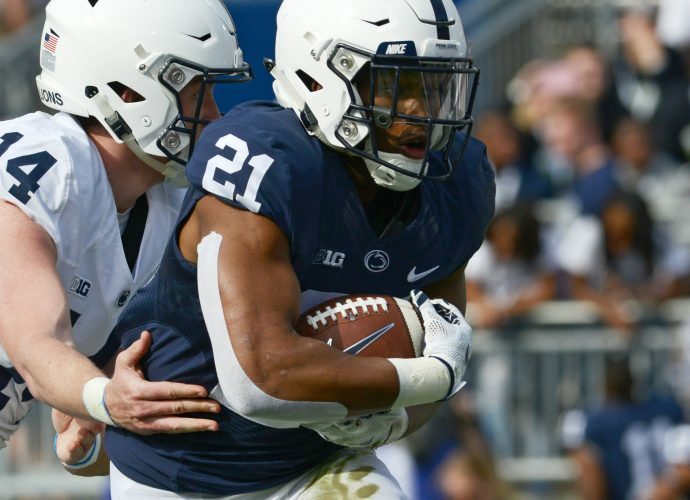 This time around, the well-respected Johnson is Penn State’s interim coach, and the longtime defensive line coach is being championed by the players to get the job on a permanent basis. “I know me and many other players would love to have coach Johnson as our head coach, he’s a great leader and will be a great head coach,” defensive end Deion Barnes tweeted. Athletic director Joyner said Johnson will be considered for the job if he’s interested. He also was asked if the players will have any input into the decision. “Only the search committee, who is a tremendous committee, has a direct influence over the search results, and they’ll do a tremendous job,” Joyner said. “It’s a great group of people. I can’t emphasize that more. Johnson will meet the media for the first time as the interim coach today. He will be on a conference call this with reporters morning and will hold a press gathering at the Lasch Building in the afternoon. Hackenberg is the so-called franchise quarterback, and keeping him in the program could go a long way to determining how successful the next coach will be over at least the next year or two. Given Hackenberg’s importance in the equation, Joyner was asked if the coaching search will focus on candidates who would help keep the quarterback happy. “Christian Hackenberg is a tremendous asset at Penn State, first of all, as a human being,” Joyner said. “He’s just a great person. He’s a great student. His maturity is off the charts, as we all know and have all learned, not just on the field, but off the field. So we were very, very interested in Christian Hackenberg as a Penn Stater. Does that mean his opinion will carry any extra weight? “I think all of our student-athletes get the same consideration, and we want a coach that can embrace Christian as well as the student-athletes that are here and one that they’ll be excited about,” the athletic director said.